Quote is all about small collections, created by Jim and Vicki. They run a very small bag studio in Bangkok, Thailand. Their designs are either few-of-a-kind or made in very small quantities. Quotes uses quality textiles and leather to construct all products with love and care. Vicki says for anyone considering starting their own small business: "just if you love it, go for it, do your best and never regret it." today they are giving away the amazing saddle bag pictured above! visit their shops for lots of lovely styles. with your favorite item from jim + vicki's shop. Danni, this is awsome ! i like every single one . but this one i think, is very prety. thank you for giving chances! That was so hard, but I think I'd go for the 3 ways leather bag in black. That's very nice and handy. What a perfect summer prize! Checked out the shop and liked the "QUOTE 2 ways leather Saddle Bag --- Navy" among many other bags. Thanks! Ididn't know this shop..and it's a great surprise! My favourite is The Criss-Cross Bag by Quote..lovely!!! This is a lovely giveaway and the bag is really really pretty! Love the unique bags they offer. That pleated in olive that you have pictured is on my list and the houndstooth criss cross - love the yellow inside. Another cute giveaway! :) I love the Quote leather and canvas bloom bag (blue denim). My favorite is tied between the canvas and leather saddle bag with stripes and the 3 way leather in light brown. Fabulous bags! i love the quote leather bag three ways in purple. what a gorgeous color! Pretty pretty store! I love the "Quote Canvas N leather Saddle bag -- blue stripes denim". Super cute! Danni, this is such a fabulous giveaway and these bags are sooo great. i've actually been eyeing one of these myself so great timing, too. I'd love to win the Quote Canvas N leather Saddle bag in stripes denim...which is what you have in the picture. Hey they have fabulous stuff. I love the baby carseat bags - all the colors but I am partial to blue. You'll find a link and tweet about this beautiful give-away this evening! Great giveaway! I like the 3 ways leather Bag. They're all fabulous. I'm a bag-aholic, so it's hard to pick my favorite. I guess maybe the Japan bag - it's so different! Glad I found your site, I've really enjoyed perusing it. i just love how unique shaped all of their bags are! i really do love the giveaway bag the best but i also have my eye on the Quote Leather and Canvas Sea Bag -- white with red! thanks for a chance to win danni! I love the bag featured in the giveaway! But this bag caught my eye too - QUOTE Candy bag 2 way Leather n Canvas (red n white) ! i <3 the navt read and white bag. QUOTE Candy - Carry All 2way Bag Leather n Canvas bag. Oh, I am smitten with the 3-way bag although I can't decide the colour. Quite like the purple though, perfect with a little summer dress. It's tough to pick just one! I do love the Quote Canvas N Leather Saddle bag in striped denim- looks like it would go with a lot! my absolute favourite is this lilac bag! I'm totally blown away by these bags! I can't decide between the 3 ways tote and the criss-cross bag. So adorable! i love the canvas and leather saddle bag in blue stripes!!! Wow, such a great giveaway! 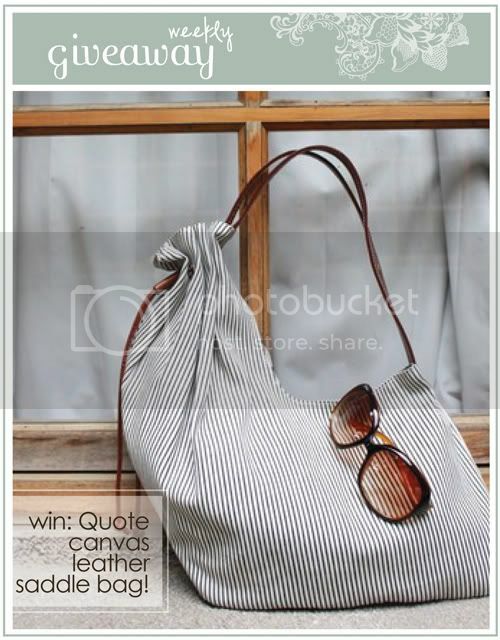 I actually love the bag that you showed in your blog the best: Quote Canvas N leather Saddle bag -- stripes denim. My absolute favorite is this bag: The 3 ways leather bag. Such awesome colors! :) Thanks for doing this! oh, what pretty things! i LOVE the quote pleated bag! LOVE! I love them all! The craftsmanship is impeccable. Hi. This is very generous of you! The Quote Canvas + leather Saddle bag that is being given away is my favorite! 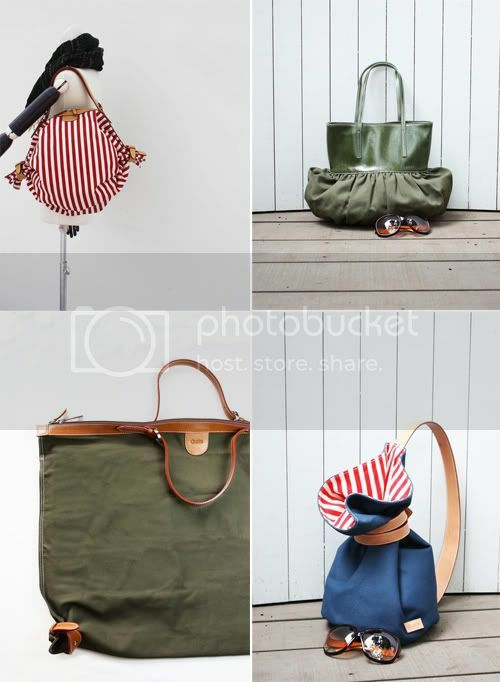 I LOVE the red canvas sea bag and the blue stripe denim saddle bag. Can't decide! What a great giveaway and great bags too! I love the 3 way leather in light brown. The giveaway one is gorgeous too! The bags are so beautiful and seem so well made! The Criss-Cross bag is my favorite. Thanks for such a fun giveaway! What great bags!! I think my favorite is the 3-way medium lt. brown leather bag (http://www.etsy.com/listing/48249984/quote-3-ways-leather-bag-m-light-brown), but all the bags are fabulous. Wow! All the designs are so clever! I love the canvas sea bags especially though. Great design! great giveaway! i love the bag featured in the photo, the canvas and leather saddle bag in stripes denim - love the shape and the way it fits under the arm. such wonderful creations! my favorite is the quote leather and canvas sea bag-white with red... although the blue is really fun too! i'm currently obsessed with the canvas sea bag - the navy, red, and white one. great giveaway!! i like the s bag coin pockets! they are so unique. Then I pick QUOTE 2 ways leather Saddle Bag --- Navy. I love the colour, and the shape (as with all their other bags) is definitely unique! Great Giveaway! I like the red and white striped saddle bag best. it would be so cute for summer. It's so hard to choose, but my favorite would be the "Candy - Carry All 2way Bag Leather n Canvas". Honestly, the canvas and leather saddle bag IS my favorite! I looooove the three way leather bag in light brown! wow, thanks for sharing this awesome shop! i can't decide between the pleated bag or a Japan street bag - both are FABulous designs! Wow, that's a tough one. Your bags are beautiful. I love the Quote Leather and Canvas Sea Bag in red. I love the Canvas N Leather Saddle Drawstring Bag -- red/white. This is a great summer bag! These bags are so much fun. Thanks for showcasing them! My favorites are the candy bags. There's just something about the tied sides that I can't get over. The bag featured in the giveaway was another favorite. I love the leather strap. The Quote leather and canvas sea bag in red is my Faavvorite! They're all fabulous! My absolute favorite is the orange baby car seat bag. So unique! i love the canvas and leather sea bags!!! what a lovely shop!! .. I love the S Bag Coin pocket by Quote, so unique! Wow they're all go gorgeous, what a great giveaway! I really like the 2 way leather Saddle Bag in navy. Here's my blog post for your giveaway! oh I love love love these bags! Interesting bags, I must say! So so cute! My favorite is actually the one you have in the picture at the top, but I also like the same style in houndstooth! I love the Quote 3 ways leather bag in black...gorgeous! oh such good items :) i love the canvas leather saddle bag! so cute! I loved the houndstooth saddle bag. So cute! Love them all, but this one is my absolute fave!! Lovin' the QUOTE 2 Ways Leather Saddle Bag in Navy. Classy AND unique at the same time. Genius! Canvas N leather Saddle bag is my fave! their bag are so creative, love them! I love the blue stripes denim bag! It's hard to say, but I think I love the Candy Carry All 2 way Bag in Leather and Canvas the very best! The quote three days in purple is just gorgeous! I love the houndstooth saddle bag! Such a classic print. oh wow this is a great giveaway! I have a big addiction to beautiful purses and this designer is very creative and makes beautiful bags. I'm in love with the Criss-Cross bag or even the Candy Carry All 2way bag. There are just soo many to choose from. LOVELY giveaway!! love the quote canvas + leather saddle bag, but also the leather and canvas sea bag -- white with red! I love the Quote Pleated Bag Leather and Canvas in olive green. Such a cute color. oh I love this! what a perfect summer bag! My favorite really is that saddlebag! I love all these wonderful bags...but the one I prefer it's absolutely the QUOTE Candy bag 2 way Leather n Canvas -- red n white! I love the Canvas N' leather Saddle bag with the blue stripes! That saddle jack, in the pretty seersucker fabric, is my favorite! It's so pretty! And just the right size! I love the criss-cross bag. my favorite is- "Quote Canvas N leather Saddle bag -- blue stripes denim"
Love the Canvas N Leather Saddle Drawstring Bag -- red/white. So adorable! the 3 ways leather bag is so fabulous! i'm in love!!! What great bags. These are fantastic for someone who travels constantly, as I do. My favorite is the brown and white hounds tooth bag. Just a great mix of a traditional fabric with a modern profile! I love the Quote Street couture Baby carseat bag in olive green! I love the Quote Canvas N leather Saddle bag -- stripes denim!! i love how quirky the bags are! my favorite might be the stripes denim one you pictured. i feel like i would use it all the time. What amazing designs! It's hard to choose which one I like best! But if I had to choose, the QUOTE Canvas N Leather Saddle Drawstring Bag -- red/white . Is darling. Its summery yet sophisticated! I think I just fell in love with a handbag. The Quote Street couture Baby carseat handbag in electic blue, that is. Oh my gosh, such a gorgeous bags! Love seeing fellow BKK designers out there! These bags are soo cool! My favorites are Quote Street couture Baby carseat bag-- electric Blue and QUOTE 3 ways leather Bag M---Black. love the 3 ways leather bag m in light brown! I love the color and the size!!! OMG, I love quite bags! My fave is the 3 ways leather bag. Want! Leather and Canvas Sea Bag -- Navy / red and white is absolutely perfect. Candy - Carry All 2way Bag Leather n Canvas nd the Canvas N leather Saddle bag. I just tweeted and facebooked your giveaway! I love the QUOTE Candy - Carry All 2way Bag Leather n Canvas!!! That baby carseat bag in orange is truly amazing. Everything about it is wonderful! But especially the orange. Oh man, that canvas and leather saddle bag with red and white stripes is amazing. I love the striped saddle bags - blue stripes denim and the red stripes, too! All of the bags are gorgeous. You know the products that QUOTE makes are amazing when you can wear their purses in 3 ways. My favorite is the leather Bag in black with the orange inside. Love this shop!!!!!! what delightful bags for a day at the sea. i love this Canvas Bloom Bag - Blue Denim.. Thanks for sharing! I just posted it on my blog.. I love the Quote Sea and the Quote Candy Bags! The bags are gorgeous. Love the 3 Way Leather in light brown. Thanks for the giveaway. I'm in LOVE LOVE LOVE with them all! One of my faves is the Quote Canvas N leather Saddle bag -- blue stripes denim! Seriously, how awesome? It is versatile and it is RED! I think my favorite is the Quote Street couture Baby carseat bag in orange! Lots of cute bags!! I adore the 'Canvas and Leather Saddle Bag - Stripes Denim'. Gorgeous! Oh I love this one: http://www.etsy.com/listing/48362240/quote-3-ways-leather-bag-m-olive-green. Fingers crossed I win! I love the saddle bags best, but I also really like the Japan Street Punk red faux leather bag! So fun! ooohhh gorgeous bags! cant go past the criss cross bag in houndstooth. so sweet! love these. my favorite's the criss cross bag! xo! Great shop--really like the 3 ways leather Bag M---Purple. Love purple!! the yellow lining is incredible! HOLY COW; what a gorgeous bag!!! YES PLEASE!!! my faaaavorite item in the store is the 2 ways leather saddle bag in navy. so so SO gorgeous!!! very cool. love the candy totes -- such a unique & functional design idea! this--http://www.etsy.com/listing/48115794/quote-3-ways-leather-bag-m-purple is by far my favorite! I love the 3 way leather bag M in blue denim! Such beautiful designs and patterns! Love the 3 ways M bag in black! What fun, easy bags - perfect for this time of year! The Red Sea bag is awesome!!!! Oooh - I've loved Quote ever since I first found them through the Bright Side Project! My favorite item currently in the shop is the S Bag Set. It all reminds me of fortune cookies, and I love the strong shape and structure of the pieces! I tweeted and included you in the tag! but everything in the shop was quite lovely! Hi Danni, i have a question. Do i have to make an etsy account first to comment on one of quotes' merchandises? I love the leather and canvas sea bag in the navy, red, and white..but I also love the one pictured above! The bags are so darn cute and original. My favorite bag is the blue and white 2 way bag. Thank you for the opportunity to win. Nice collection of bags... Good luck to those who will win.